The gaming, travel and automotive sectors are ripe for virtual reality engagements; immersive gaming experiences (once the issue of movement lag has been addressed) could provide some of the best and most entertaining experiences yet (still waiting for Project Morpheus, looking at you PlayStation). Travel could begin to border on Total Recall-style experiences, without the undesirable side effects (murderous wives, planet wide conspiracies etc). Just imagine the automotive configurators that could be built into VR using something like Leap Motion integration too (hello Minority Report). Echoing the sentiment of the Marketing author, don’t even get me started on the adult industry. VR is agile and adaptable, able to deal with many commercial design aspects, including virtual design, design simulation from build to testing, research and analysis, design configuration and orchestration as well as being able to be hosted on multiple platforms, making it an ideal tool for the shopper marketing sphere. The key differentiator here is the ‘SmartER Connections’ element; by helping brands to understand how shoppers experience their products in different environments and what the most compelling shopper content is, we as agencies, can advise and implement experiences that augment and bolster these product experiences, be it in retail, at events or online. Ultimately, we are all looking to help brands connect, inspire and engage their shoppers, to help drive them along the consideration and purchase funnel, using cutting-edge technology that compliments, rather than complicates the process, while all the time capturing data to refine and personalise the experience, while walking the convenient/creepy line very carefully. The idea that we can now design, pilot/test and tweak shopper experiences in VR is intriguing, allowing for the integration of big data just makes the opportunity that much more scintillating in terms of how we can provide experiences that are immersive and measurably so. The next elevation of VR is to be able to enfold the principles of neuroscience into the process, allowing for us to make sure brand experiences in the shopper environment are not only inspiring and engaging, but also emotive. If we can create an emotive connection with the experience, we can further drive the desire behind purchases; VR experiences allow these strategies to be adaptable and customisable to the shopper, at a scale just not achievable in the real world. 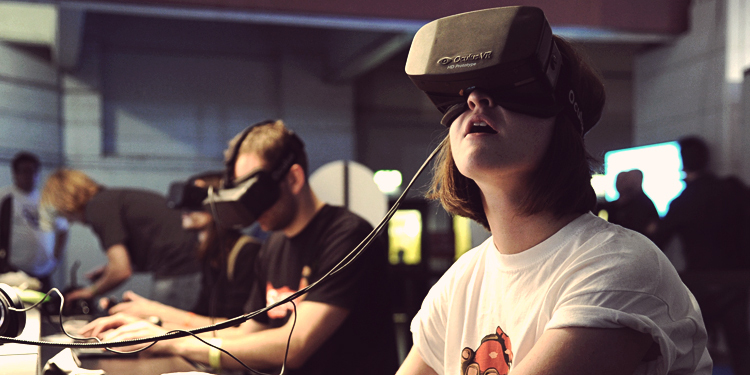 Virtual reality is now a reality and brands that choose to ignore this fact really are missing a trick in learning new and innovative ways to engage with, and understand their customers. Now that we have awesome VR, where’s my hover board and power lace Nikes please?